A recent reassessment of the skeletal evidence from King William Island supports the 19th century reports of the local Inuit people; that members of Sir John Franklin’s failed expedition resorted to cannibalism in order to survive. In 1845, the British naval expedition to map the Northwest Passage through the Canadian Arctic, led by Sir John Franklin, ended in unmitigated disaster (Gibson, 1937). As there were no survivors, archaeologists and historians have relied on the archaeological evidence and the testimony of the local Inuit people, in order to determine what occurred during the final throes of the expedition (Keenleyside et al., 1997). The Inuit testimony from the 19th century provided to John Rae, a cartographer, Charles Hall and Frederick Schwatka, American adventurers, described starvation and cannibalism amongst the ill-fated survivors of the expedition (Gibson, 1937; Cyriax, 1939; Owen, 1978). These claims which were highly controversial at the time, and when the story of the expedition reached England in 1854, it met with mixed response. Many accepted cannibalism as a tragic necessity for survival, but others felt it unproven, that the testimony was unreliable, or chose to ignore the evidence (Cavell, 2009, 2013; Brandt, 2011: 368-372). Archaeological studies of surface scatters of human skeletal remains from the expedition sites on King William Islands, from the 1980s and 1990s, provided support to the Inuit testimony of cannibalism. 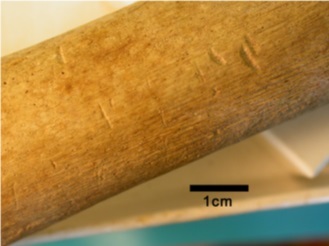 These studies identified cut-marks on 92 of the 304 bones recovered from the islet in Erebus Bay (Keenleyside et al., 1997), and a femur recovered from Booth Point (Beattie, 1983), which were believed to be associated with flesh removal and dismemberment. More recently, 4 of the 79 bones recovered from Erebus Bay in 2013 also showed evidence of post-mortem cut-marks (Stenton et al., 2015). While the archaeological evidence potentially testifies to defleshing and dismemberment, it was not clear if there was evidence of end-stage cannibalism, where the bone was broken to extract the bone marrow. Of the skeletal material obtained from islet in Erebus Bay, 3 long bones were recovered which demonstrated breaks exposing the marrow cavity, but when this breakage occurred, and if it was the result of cannibalism was unclear (Mays and Beattie, 2015). 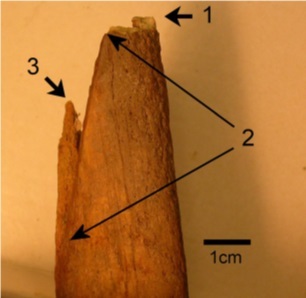 Figure 1: Mid-shaft of femur, showing shallow furrows and small pits (from Mays and Beattie, 2015). A recent study by Mays and Beattie (2015) reassessed the skeletal material from Booth Point and Erebus Bay, recovered in 1981 and 1982. Mays and Beattie (2015) evaluated the evidence for knife marks, burning, in addition to studying post-mortem fractures and the presence or absence of pot polish. Evidence for cut marks or burning can relate to cannibalism in general, whilst post-mortem fractures and the presence of pot-polish provide evidence for the extraction of marrow fat. The reassessment was completed through gross visual inspection under strong light, using a hand lens and scanning electron microscopy as needed. In this type of analysis cut-marks, typically knife marks, are identified as elongated grooves with a V- or U-shaped cross section. These may also show parallel, longitudinal striations within the cross section, with similar weathering to the hard cortical surface of the bone (Walker & Long, 1977; Greenfield, 1999). The burning of fresh bone can cause warping, fragmentation, and colour changes. Between 185-200C, this colour change will take the form of a darkening in colour (Nicholson, 1993; Munro et al., 2007), therefore colour changes would be expected of bones burnt in campfires. In the case of boiling,which is difficult to detect in skeletal remains, colour change would not be expected (Munro et al., 2007; Solari et al., in press). In archaeological bone, recent ante-mortem breaks have clean, unweathered edges, while a fracture occurring shortly post-mortem will have edges that show weathering with the external cortical surface of the bone (Johnson, 1985). Fresh bone is significantly more elastic due to its organic content, which degrades after death. Therefore, the typical fracture pattern of dry bone differs from that of fresh bone (Outram, 2002), and criteria have been developed to distinguish between the two. Carnivore gnawing and other animal damage was distinguished from human breakage and tool marks using established criteria (see Haynes, 1983). Pot polish in the reassessment, is defined as the greater reflective capacity of a bone surface due to polishing; which arises from contact between bone and a cooking vessel when bone pieces are stirred and/or boiled in water (White, 1992: 121-127). Figure 2: Distal end of partial tibia: 1) Fresh break; 2) Limits to area of polishing; 3) Break (non-recent) not showing evidence of polishing (Mays and Beattie, 2015). Mays and Beattie (2015) reported that the bones showed evidence for burning. The only bone to show clear evidence for tool marks was a partial femur which showed three knife marks on the posterior surface, the longest of which was 13mm. There were clear signs of animal gnawing at both ends of the specimen. They reported that two specimens, a left tibial shaft and a right femur, showed evidence for polishing at their ends. Scanning electron microscopy indicated considerable fine scratch marks along the polished area of the tibia, but few on the femur. Mays and Beattie (2015) concluded that the polishing seen on the tibia and femur is pot polish, characterised by abrasion/polishing to the ends of bone because of contact with the walls of a cooking vessel (White, 1992: 120-124). This is supported by the account of In-nook-poo-zhe-jook, an Inuit informant, who told Charles Francis Hall that in 1861, he had seen human bones that had been ‘broken up for the marrow in them’ piled up near a cooking place, and nearby were remains that had been boiled (Woodman, 1991: 188). The findings of Mays and Beattie (2015) along with the previous findings of cut-marks by Beattie (1983), Keenleyside et al. (1997) and Stenton et al. (2015), support the testimony of the Inuit informants from the 19th century, and paint a gory and tragic picture about the final days of the expedition survivors. Beattie OB. 1983. A report on newly discovered human skeletal remains from the last Sir John Franklin expedition. Musk-Ox 33: 68–77. Brandt A. 2011. The Man Who Ate His Boots: The Tragic History of the Search for the Northwest Passage. Jonathan Cape: London. Cavell J. 2009. Going native in the north: reconsidering British attitudes during the Franklin search, 1848–59. Polar Record 45: 25–35. Cavell J. 2013. Publishing Sir John Franklin’s fate. Book History 16: 155–184. Cyriax RJ. 1939. Sir John Franklin’s Last Arctic Expedition. A Chapter in the History of the Royal Navy. Methuen: London. Gibson W. 1937. Sir John Franklin’s last voyage. Beaver 268:44–75. Greenfield HJ. 1999. The origins of metallurgy: distinguishing stone from metal cut-marks on bones from archaeological sites. Journal of Archaeological Science 26:797–808. Haynes G. 1983. A guide for differentiating mammalian carnivore taxa responsible for gnaw damage to herbivore limb bones. Paleobiology 9: 164–172. Keenleyside A, Bertulli M, Fricke HC. 1997. The final days of the Franklin expedition: new skeletal evidence. Arctic 50: 36–46. Munro LE, Longstaffe FJ, White CD. 2007. Burning and boiling of modern deer bone: effects on crystallinity and oxygen isotope composition of bioapatite phosphate. Palaeogeography, Palaeoclimatology, Palaeoecology 249: 90–102. Nicholson R. 1993. A morphological investigation of burnt animal bone and an evaluation of its utility in archaeology. Journal of Archaeological Science 20: 411–428. Owen R. 1978. The Fate of Franklin. Hutchinson: London. Solari A, Olivera D, Gordillo I, Bosch P, Fetter G, Lara HL, Novelo O. in press. Cooked bones? Method and practice for identifying bones treated at low temperature. International Journal of Osteoarchaeology. Stenton DR, Keenleyside A, Park RW. 2015. The “Boat Place” burial: new skeletal evidence from the 1845 Franklin expedition. Arctic 68: 32–44. Walker PL, Long JC. 1977. An experimental study of the morphological characteristics of tool marks. American Antiquity 42: 605–616. White TD. 1992. Prehistoric Cannibalism at Mancos 5MTUMR-2346. Princeton University Press: Princeton. Woodman DC. 1991. Unravelling the Franklin Mystery: Inuit Testimony. McGill-Queens University Press: Montreal.